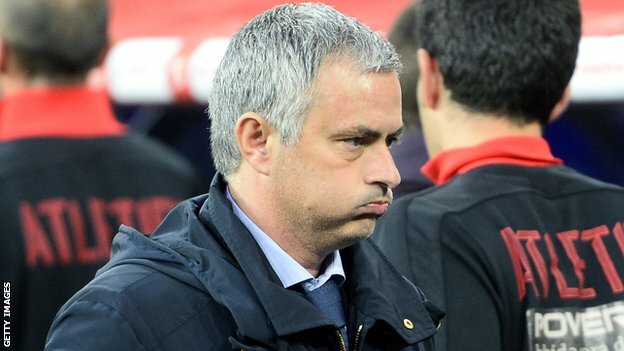 Real Madrid manager Jose Mourinho described his season as "the worst of my career" following his side's 2-1 Copa del Rey final defeat by Atletico Madrid. Eight central referees and 24 assistants, including fourth referees, have been named to officiate the 27th Week Glo Premier League matches on Sunday. The list was announced by the Referees Committee of the Ghana Football Association for the matches which are all to be played on Sunday, May 19. This week’s crushing verdict by the Ghana Football Association that banned champions Asante Kotoko from playing their Glo Premier League home matches at the Baba Yara Stadium for an indefinite period could prove the defining moment for the club’s title-winning chances this year. Eight out of 23 teams push off the Dwadefo Adanfo Greater Accra Hockey League at the National Hockey Stadium today as CEPS brace up to redeem their image after losing last week’s gala trophy to Exchequers. 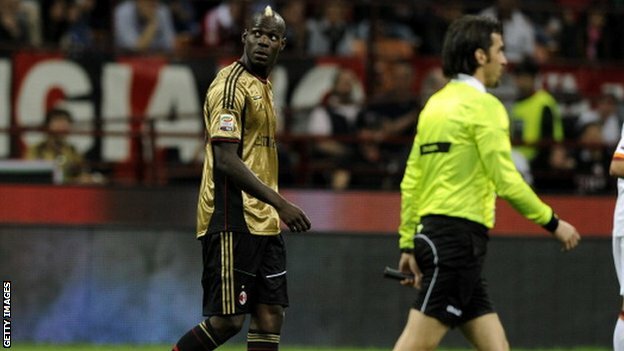 Mario Balotelli has threatened to walk off the pitch if he is ever again subjected to racist abuse from fans. League leaders Kumasi Asante Kotoko, relegation threatened Berekum Arsenals and enterprising Aduana Stars have all been handed temporary bans from their home grounds following fan violence. Tough sanctions will be handed offenders in a move to check fan disorder as the Premier League Board tries to tackle acts of violence and hooliganism. At 73 years, burly-looking, strong and healthy, one is likely to overlook Ebenezer Charles Oko Addy as any other Ghanaian who has worked hard in his youthful days and now enjoying his retirement. But beneath that down-to-earth demeanour, lies a legend, one among a number of stars, particularly, the four who in their time, ensured that Ghana’s name was etched in the history books when the roll call of Commonwealth gold medalists is listed. Ghana’s star performers at the 2013 Africa Cup of Nations, Wakaso Mubarak and Fatau Dauda, have been nominated for honours at the second National Player Awards (NPA) slated for next month. Title contenders, Berekum Chelsea, Medeama SC and Kumasi Asante Kotoko, are all tied on points at the summit of the Glo Premier League log and with just four matches to draw the curtains on the competition, it appears the race could be heading for a photo finish. Wigan's eight-season tenure in the Premier League came to an end as they were hammered at Arsenal, who moved back into the Champions League places. Doubts over the Michael Essien Charity Game scheduled for next month has been cleared as Ghana’s 2014 World Cup qualifier against Sudan is shifted. Accra Hearts of Oak captain Mahatma Otoo, has taken his goal tally to 16 and further consolidated his hold on the top spot of the scorers’ chart. Three cases pending before the Disciplinary Committee of the Ghana Football Association have stayed the official declaration of Division One Middle League participants for the 2012/13. Roberto Mancini has been sacked as Manchester City manager after three-and-a-half years at the helm. Champion club Kumasi Asante Kotoko returned to the summit of the Glo Premier League standings yesterday after an emphatic victory over Arsenal at the Golden City Park toppled Berekum Chelsea who were crushed by Hearts of Oak in Accra. Ghana defender Isaac Vorsah underwent surgery last Friday to fix his damaged knee ligaments which have ruled him out of action for six months.